When I moved to Bristol, oh must be about five years ago now, The Spark was actually the first free magazine I came across and it really is something special. Connecting like-minded people from all over the west, well, all over the world actually, as far afield as America, Australia and Chile and copies are even sent to a cooperative in Romania! So it was truly fantastic to meet and interview one of the lovely people behind it – Darryl Bullock. 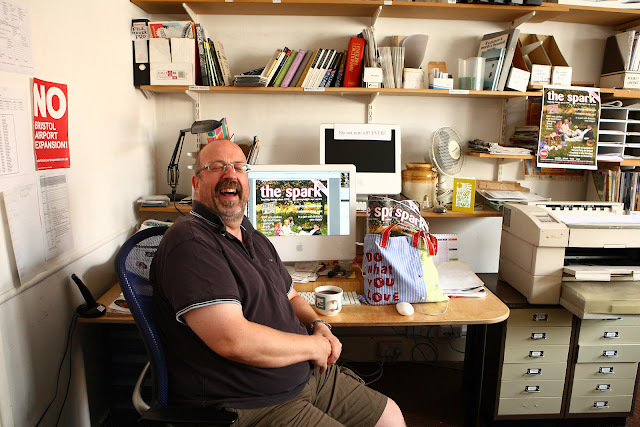 Darryl Bullock - Owner and publisher of The Spark, The UK's biggest ethical/green issues magazine. I publish the UK's biggest ethical/green issues quarterly magazine. 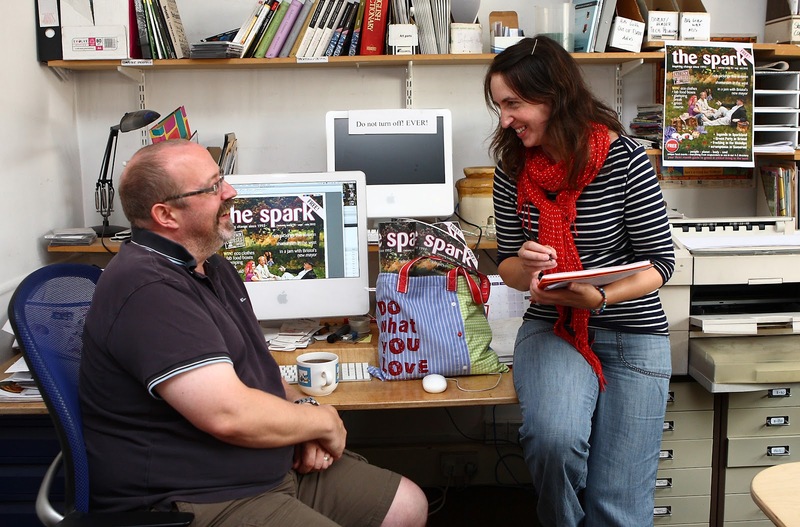 The Spark covers green, ethical, eco, community, family and food issues around the west country and has been doing so since 1993. The fact that we're making a difference; we're helping people change the way they live for the better – better for them and better for the planet. How long have you been running The Spark? I've been writing for the magazine for around ten years. Three years ago the founder of the magazine, John Dawson, asked me if I'd like to buy it off him - so I now own the business and am publisher as well as contributor to the magazine. It also means that I have staff, offices and tax bills to worry about! I gave up work at 30 and went back to college to study journalism; over the last 17 years I have written for a number of local, national and international publications and edited different sections of the Spark before taking over the magazine. Before retraining to be a journalist I worked in the music industry – music is one of my great passions! I ran a number of independent record shops – and used to love that. We could decide what was played and had control over how it was run and really got to know our customers – but after many years and working around the UK all the independents were being bought up by the big record shops. I did manage an HMV shop for a while – but when we started getting instructions from head office about what record we had to play and at what time – for example Kylie at 10.00 - I just knew it was time for me to go and do something different. The fun, excitement and freedom of that industry had changed so completely that it was no longer something I enjoyed. So I thought ‘what can I do?’ and seeing that I left school with 3 O-levels and didn't feel I was really qualified in anything else other than retail and music, needed to think about it. So after taking some time out I decided to pursue my other passion – writing. I’d always written. From a really young age I always had a notebook with me: I wrote a lot of poems, ideas for short stories, and still do. So that’s what led me to where I am now. I think if you are a writer then you’ll know you are as you’ll write all the time! Four months into my studies in Bristol I had my first piece published in the Bath Chronicle. I went on to write some 200 pieces for them over the next three years. From there I went to work for a fruit and veg supplier and started writing about veg! I really enjoyed that as I do like my food so it was another area that interested me. My writing was spotted and I was approached to write the food pages for the Spark – and that’s how I first became involved with the Spark ‘community’. It is more like a family than a business. We have lunch together and once people have joined they don’t leave. It really is a special place to work and be part of. Just as things were becoming more difficult as a freelancer – for me and everyone else – the opportunity to buy The Spark came up. I was approached by John Dawson, who founded the magazine, as we'd worked together for many years and he thought that I would look after it and the respect the magazine's ethos. Being asked was a huge honour. We had to work out a ‘sparky’ deal to enable me to buy it though, as at the time I couldn't afford it – but it was something we both wanted and believed in so spent a good few months working out a way to make it happen. And it happened! I feel I have been very lucky as I have never been without work – being a freelance writer is getting tougher and tougher, but things seemed to happen in a natural way for me, which I feel grateful for. What was the biggest challenge you faced taking over as owner and publisher? It’s been a huge learning curve going from being a freelance contributor to owner and publisher, as I didn't really know anything about how to publish a magazine . That's been the biggest challenge I’d say. We have a ‘core-team’, who work part-time on the magazine as we all have other interests outside, as well and around 20 freelance contributors who work with us. So I’ve learnt by doing. I love learning so it’s been a joy (and bloody hard work). Working with people who care about what we do – it really is like a family. And meeting so many amazing people who love what they do. Can you tell me about any success stories of how The Spark has helped someone? There are so many it’s not easy to pick one! We really do get emails on a daily basis from people telling us how The Spark has inspired them. Most recently we've heard from a group of people who set up a wood recycling project after reading about the one here in Bristol that we featured in an issue. And we often get asked to send copies to people who used to live here – but have since moved – one lady rang us the other day asking for a copy to be sent to her in Scotland as she was coming down to Bristol for a few days and knew the only place to get up-to-date on everything that has been going on was by getting a copy of The Spark. That’s pretty amazing I think and one of the reasons I love doing this. A batch of each issue gets sent out to a co-operative in Romania, through our friends at Essential Trading in Bristol. We don’t deal with this directly, but apparently they were sent a few copies some years back and now they always request the latest issue with their order! Last year we even got a mention on Points West – not for what you might think – It was when we had that really cold snap. They interviewed a lady from Norway who now lives here for some tips on how to keep warm. She very proudly said she uses her old copies of The Spark after reading it from cover to cover, screwed up and put in her boots! I was pleased to see that after being read it was having another use! That I’m much more tolerant now. I’m a very opinionated person and have learnt to listen to other people’s views and opinions and to respect them for that and not be dismissive. The Spark offers everyone a forum – a platform for people to have a voice and share their views – and even though I personally might not agree with them – I respect their different take on things. When the Spark first started – 19 years ago (it’s our 20 year anniversary next May!) it was viewed as very much off the wall – but 20 years later we have seen a huge change and now being green and things that were once viewed as ‘alternative’ are much more mainstream and the norm. When it comes to writing I’d say 'trust yourself and check everything', check your facts: do your research – make sure you know about who you are interviewing before meeting them. You’d be amazed by the amount of freelance writers we get applying to write for us who've never even read a copy of The Spark!! Writing isn't an easy path, but you’ll know if you are a writer – as I said earlier – if you write all the time then you’re a writer! 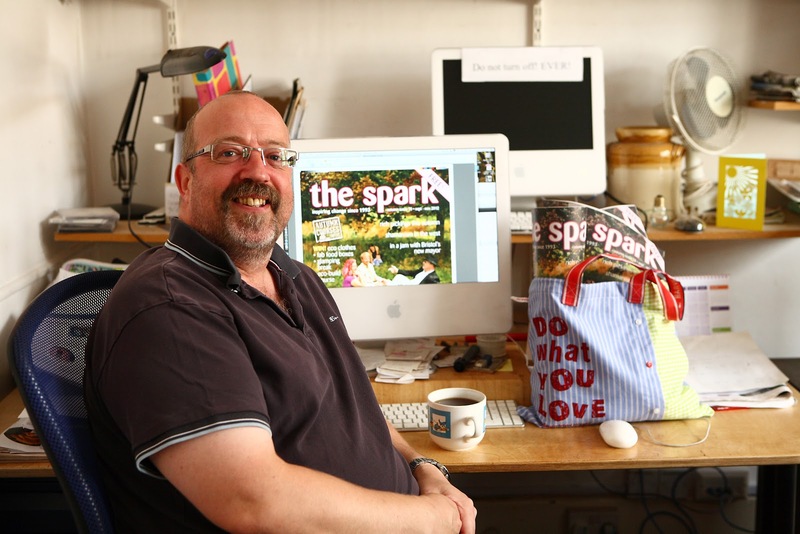 We've recently launched a monthly e-newsletter, ‘The Sparkler’, which you can get direct to your inbox and you can also read a copy of The Spark online. We aren't planning on making any big changes! And of course we’ll be celebrating our 20 year anniversary next May. We haven’t decided what we’ll do exactly – but we have a number of companies who have advertised with us since the very beginning so we’ll be looking to do something with them. We actually run a form of barter system with some of the long-running advertisers – again I think that’s something a bit different and works well for both parties – but no actual money is involved. The Better Food Company is one example. They have been with us since the very beginning sand for a number of years they supplied us with a weekly vegetable box for our shared team lunches in exchange for an advert in the magazine. It’s a lot about community. And for me, personally, I write a music blog that’s dedicated to the worlds worst records! I love ‘bad’ music! 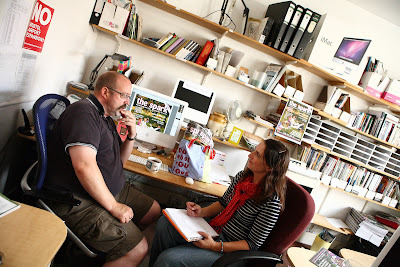 I’m currently working on a book of the blog and have been talking to Richard Jones at Tangent Books, another Bristol-based company, about publishing it next year. My current favourite track is : Banana – What a Crazy Fruit by Rusty Canyon & The Banana Boys..